Anchorage police want to start using drones, with officials saying the small, unmanned aircraft could help them investigate crimes and find missing people more quickly. 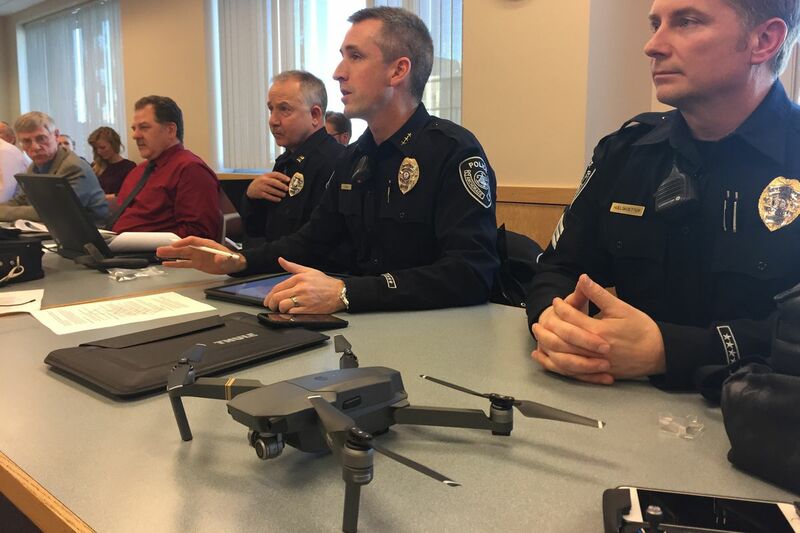 Police officials released a draft drone policy Wednesday in an Anchorage Assembly committee meeting. Chief Justin Doll said his agency has been exploring the idea for about a year. By releasing an early version of the policy, Doll said he and his deputies hope to address public concerns, including over privacy and surveillance. The draft policy includes an outline of Federal Aviation Administration requirements and says police will obtain a warrant before using a drone "in a manner that may intrude upon reasonable expectations of privacy." Some Anchorage Assembly members voiced concerns about privacy during the Wednesday meeting. Assemblyman Forrest Dunbar said he could see the benefits of drone use in police activities, particularly in search and rescue. But he said he was concerned the current version of the Anchorage Police Department's policy didn't go far enough to resolve privacy questions. "The worries about surveillance, in particular, and privacy are real," Dunbar said. He and others said Anchorage should look to adopt a broad law about drone use. The discussions come as the Anchorage Police Department is positioning itself to become the first law enforcement agency in Alaska to start using drones for day-to-day police work. In 2014, the state Legislature authorized law enforcement agencies to adopt procedures for drone use. Drones, known formally as unmanned aircraft systems, have become increasingly popular in recent years. The Alaska Department of Transportation and Public Facilities is now using drones for day-to-day work. Anchorage's city-owned utilities have already been using drones for surveying and to track landfill use, said city manager Bill Falsey. But he said police fall into a special category that demands more transparency. To come up with a draft policy, Anchorage police officials consulted with agencies in the Lower 48 as well as the FAA, according to Doll. In a Wednesday presentation to Assembly members, Capt. Kevin Vandegriff, the head of the agency's crime suppression unit, showed a drone video from a police department in Alameda County, California. The video showed drone footage of suspects who were darting around buildings and yards. Such tactical information can help reduce risks for officers, Vandegriff said. He said a drone could have helped commanders in a SWAT call in Anchorage last September when a barricaded suspect was exchanging gunfire with police. "It's almost negligent to not use a drone," Vandegriff said. "It's inexpensive and saves lives." Vandegriff noted that police have used cameras for a long time. This is just a camera in the air, he said. The devices are also cheap, he said, running at less than $1,000 with a powerful camera. He showed another video in which police in North Carolina used a drone to find a woman hiding in a cornfield. Footage showed the drone navigating over rows of corn before settling over a figure in a purple hoodie. The search took less than 30 minutes, Vandegriff said. Several years ago in Anchorage, police investigating a killing learned the body was in a patch of woods. Troopers came in with a helicopter to help locate the body, Vandegriff said. The body was found. But the rotor wash from the blades decimated the crime scene, Vandegriff said. He said a drone would have been far less disruptive. Vandegriff said police would not use drones for warrantless searches, undercover surveillance, routine patrols or high-risk missions. He said police do want a drone to collect evidence, investigate crash scenes, find missing people and to help police commanders make decisions in a crime scene. Police officials met with the American Civil Liberties Union of Alaska on Wednesday morning to discuss possible issues, Doll said. APD will also have to gain a certificate from the FAA before officially starting a drone program, he said. Assembly members generally agreed that a local ordinance should be passed before police can start using drones. Dunbar said the Assembly should create a special subcommittee to work with the police on the new law.